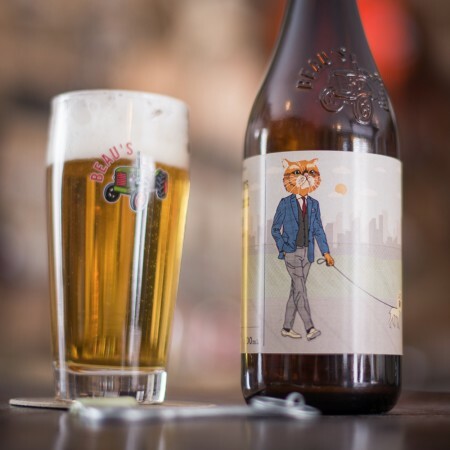 VANKLEEK HILL, ON – Beau’s All Natural Brewing has announced that a beer inspired by the “happy accident” that befell the very first batch of its flagship Lug Tread Lagered Ale will be returning soon, this time with its widest distribution yet. Haters Gonna Hate is essentially a stronger and hoppier version of Beau’s award-winning flagship ale, Lug Tread – but there are noticeable differences that go beyond ABV and IBUs. Unlike the brilliant golden Lug Tread, Haters Gonna Hate is unfiltered, and has a warm golden-orange hue. Brewers chose Nelson Sauvin hops to add a mild muskiness, as well as tropical aromas suggesting mango and papaya. The clean malt presence typical of a Kölsch allows for full display of the hop-driven fruit flavours, and the beer is balanced with moderately high bitterness. Bottles of Haters Gonna Hate will be released tomorrow (April 20th) at the Beau’s retail store and BYBO delivery service, and LCBO locations in Ontario, with distribution to stores in Québec, British Columbia, and Alberta following in mid-May. Draught product will also be available as of mid-May in all provinces where Beau’s beers are available.